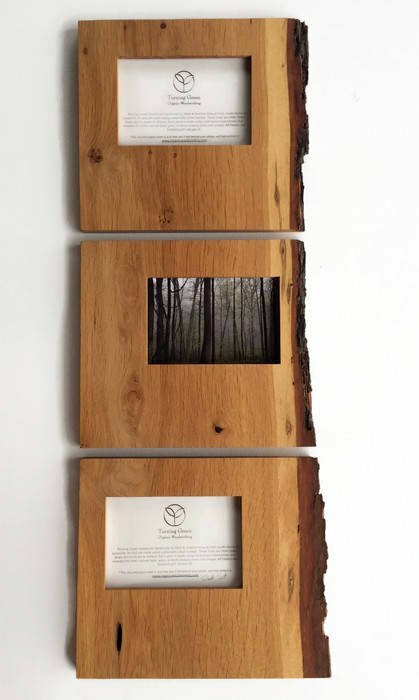 This handmade wooden picture frame set is made from sustainable city trees that came down due to natural causes, like lighting or disease. Each piece is hand made and is one of a kind. Variation should be expected - all three pieces are from the same wood plank, so when hung they line up. It's an extraordinary presentation of beauty in woodworking. -All lumber from these trees is professionally kiln dried. Only clear environmentally friendly finishes are used, so all colorings are completely natural and unaltered. -Each piece has a solid wood backing that matches the front- no cardboard, and the maker's logo is on the back corner. 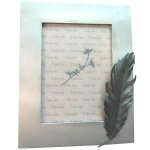 Recycled paper inserts are acid free.-Wall frames range from 9x9" - 11x12", Sets are about 29" tall when hanging. Photo openings are each 5x7"